There’s something to love about a no-nonsense kind of guy. He tells it like it is. He’s not fancy. But he cleans up nice in blue jeans and a soft t-shirt. He’s ‘salt of the earth’ … which means “basic and fundamental goodness”. 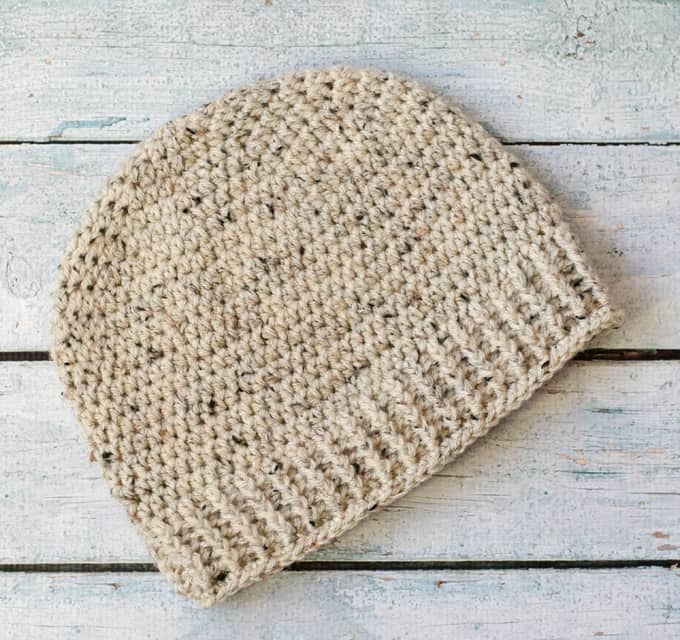 The perfect description for this Salt of the Earth Men’s Crochet Beanie.It’s easy to make and yet beautiful in its simplicity. I think it’s hard to find a good man’s hat pattern. One that is simple. Not too blingy. Understated, but classic. So I decided I’d make my own. 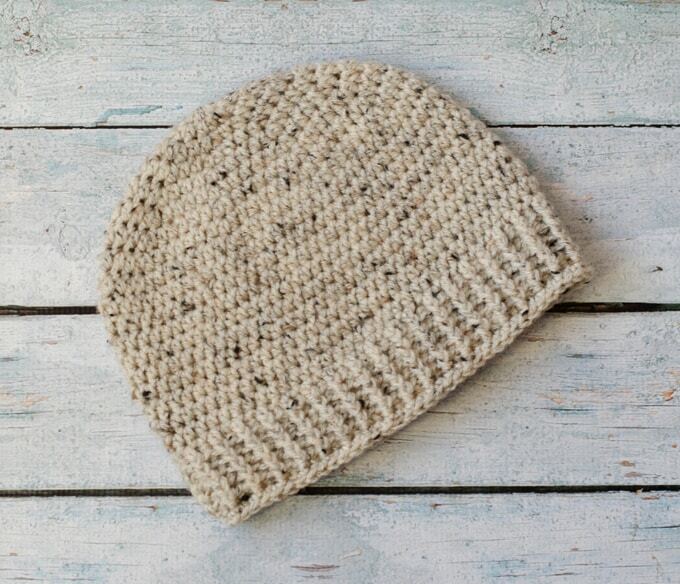 The Salt of the Earth Men’s Crochet Beanie uses just one skein of yarn and works up really quickly. A joy to make. And great to give. My guy loves his and I hope yours does too. 3 oz Worsted weight yarn. I used Lion Brand Vanna’s Choice in Oatmeal. Fits a medium sized adult. Finished size: About 20″ around by 8.5″ long. R1: 8 hdc into ring (8 sts). Work in rounds through row 18. R10-18: hdc around (72 st). At end of row 18, sl st in next st.
R19: ch 2, hdc around (72 st), join. R20-24: ch 2 (counts and 1st st), *front post hdc in next st, back post hdc in next st* repeat * to * around. Join with sl st to top of 1st st.(72 st). I love seeing your finished projects! If you share your Salt of the Earth Men’s Crochet Beanie on Instagram, be sure to tag me @crochet365knittoo. If you are on Facebook, stop over to the Crochet 365 Knit Too Facebook page and share a photo! I’d love to see your work! Written pattern copyright Cheryl Bennett 2018, all rights reserved. Please do not reprint or repost this pattern. If you would like to share this Salt of the Earth Men’s Crochet Beanie pattern with others, just link to this page. If you’d like to make items for sale from this pattern, please visit my About page for more information. It doesn’t say whether you join at the end of the rounds??? If you look at the first row,the instructions tell you that the hat is worked in continuous rounds, so you do NOT join at the end of the rounds until you get to the ribbing. I love the ribbing on this hat, but I can’t get the stitches to line up. Any hints? Since you are working in the round, with the right side always facing you, the post stitches should line up on top of one another (assuming you still have an even number of stitches). You could try putting a stitch marker every so often to remind you what type of stitch goes in a particular spot. That might help you keep on track. I have made by now over 48 of these beanies for the birthday party that is held every month at our local mens homeless shelter. Each “birthday boy” receives a beanie and other items from our church and the beanies have been a total success and hopefully they are keeping these men warm this winter.